Vancouver is really flaunting it’s glamorous side when it’s a bright sunny day. The fact I can enjoy it on ‘my day’ makes it even more enjoyable to make the most of being outdoors in Springtime here. This is the first entire weekend since we arrived in March, that it has been warm from sunrise to sunset. For those that know me, a day filled with family, friends and food is a day in heaven, which made for the perfect Mother’s Day. It started with me being able to wake up a reasonable time; the biggest gift from my son was AMAZINGLY sleeping in till around 7:30am – that never happens! My husband presented me with beautiful peonies in season with card and a new addition to my spring wardrobe with some pop colour excited me and I was ready to get going. First stop, Granville Island – morning spent with another fellow Aussie Mum at Granville Island enjoying coffee and rustic pastries from Terra Breads (one of the best artisan bakeries in Vancouver). Oyama Sausage Company (amazing duck pate, terrines, speck and chorizo!). Oyama also sell green label products which do not contain any nitrates or nitrites. They claim that their other products are cured traditionally so the levels of sodium nitrite are much lower than that found in many organic green-leafy vegetables. The Salmon Shop (Fresh BC salmon in many forms). I have learnt that 6000 pounds of salmon are sold every week in Granville Island’s Public Markets and I can believe it because it tastes so good! Terra Breads (artisan bread, pastries). There is something delicious here to delight all. Say no more. Petit Ami (organic and fair-trade coffee). This company is so passionately committed to the environment and ethically grown coffee. You can’t help feeling like you have made at least a small contribution to their grand efforts to run their business in an environmentally responsible way. Next Stop, EPIC expo (which I will write about following this post) and then home to enjoy a sustainable seafood dinner prepared by my loving husband. 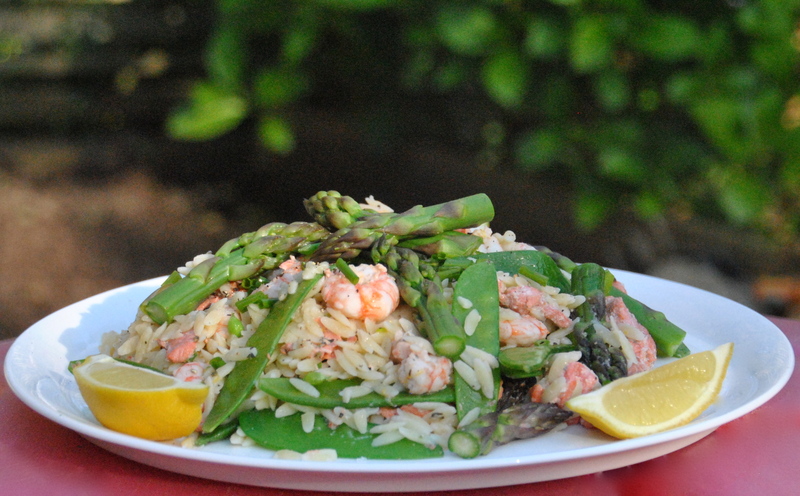 The star ingredients in this dish are BC Spot Prawns and Alaskan wild salmon. The BC Spot Prawns have a season of about 6-8 weeks and in May at the start of the season the False Creek Fisherman’s Wharf even celebrate a Spot Prawn festival which sells out quickly. Risoni with lemon pepper prawns. The inspiration of this recipe has come from delicious. magazine, Australia published on http://www.taste.com.au. I was very fortunate to have the pleasure of working with the AMAZING and SERIOUSLY talented food team led by Valli Little, Food Director on delicious. for several years. I have just added the addition of salmon and asparagus (just in season here) and excluded the snow pea sprouts. The sweet taste of the prawns, meaty texture of the salmon as well as crunch of the greens makes for an exceptional choice for this time of year to take advantage of all the delectable produce on offer. What made it more of a treat is that it was prepared by my husband with Canadian Club in hand. There was just enough room to follow with a lime tart from Whole Foods Market. Enjoy!